COME IN TODAY AND MAKE YOUR SMILE EVEN MORE VIBRANT! WE CAN HELP YOU ACHIEVE THE SMILE YOU'VE ALWAYS DREAMED OF! GOOD DENTAL HEALTH STARTS WITH REGULAR PREVENTATIVE CARE. EXCELLENT DENTAL CARE IN A RELAXED, COMFORTABLE ENVIRONMENT. "He saved my life. If it wasn't for Dr. Ferguson checking my tongue for any abnormalities, I would have never known about the cancer that was present." 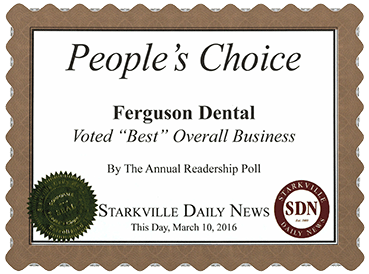 "Dr. Ferguson and his staff are the best! They’ve handled everything from cleanings to crowns for me, and I’ve been very pleased with the work and their commitment to a positive patient experience." "Dr. Ferguson completely eased my anxiety about going to the dentist! He and his staff take great care to make sure you have a relaxed appointment and that you are comfortable the entire visit." "I’m always happy to recommend Dr. Wesley Ferguson to any of my friends looking for quality dental care. His staff is always on top of things and I can’t say enough about how confident I feel about trusting all my dental care to Dr. Ferguson. There’s really no other option for me." "”Magnificent” is the word that best describes the treatment I have received from Dr. Ferguson and his staff. I have severe dental issues stemming from salivary gland cancer. Dr. Ferguson has worked closely with me and my oncologist to develop a dental plan that allows me to keep my natural teeth as long as possible. He has accomplished this with compassion and professionalism. He and the staff always make me feel special." "My dental health is an ongoing problem due to Dry Mouth Syndrome. I have had many dental emergencies since Dr. Ferguson has been in practice - his staff is very efficient at getting me in and Dr. Ferguson has even worked on his day off when my situation requires an extended amount of time. Dr. Ferguson does a great job at explaining options and providing pain relief." "Dr. Ferguson has obviously chosen the right field. He really has a talent for making his patients feel comfortable. I would recommend him to anyone." "Going to the dentist is never fun, but Dr. Wesley Ferguson and his friendly staff made it a more enjoyable experience. The dental work that Dr. Ferguson performed made me feel more confident about my smile than ever." 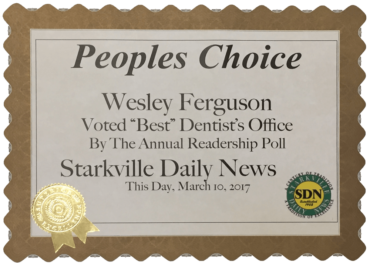 "Dr. Wesley Ferguson not only has a great personality, he also has all the new technology needed for today's dentistry. His enthusiasm for his profession is enlightening! I highly recommend the zoom teeth whitening procedure! My whole family is crazy about him."